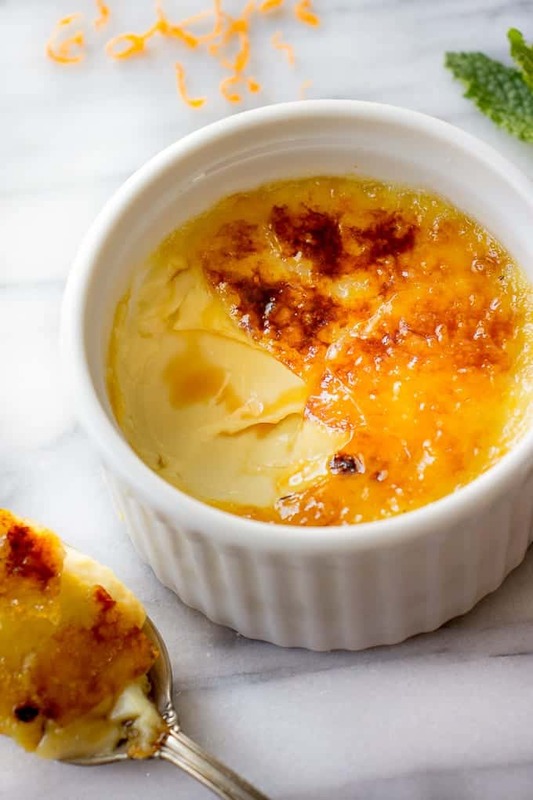 Hands down, the Best Creme Brûlée Recipe is right here. Easy-peasy, creamy, melt in your mouth dessert your family and friends will devour in no time and ask for seconds. 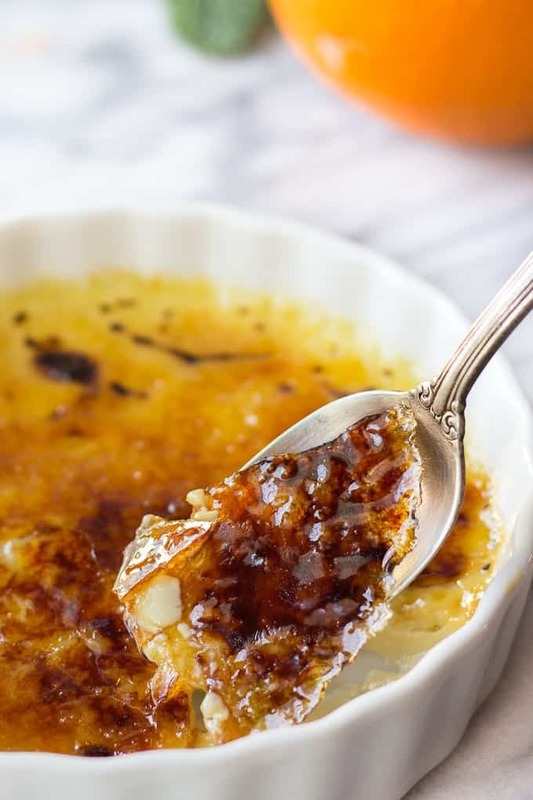 In my opinion, Creme Brûlée is one of the most delicious and easiest French desserts ever. In a classic recipe you would literally use 4 ingredients and end up with silky smooth and aromatic dessert worths making again and again. From there, you can make a step further and add one or two more of your favorite ingredients for even more decadence and deliciousness. By the way, did you have a chance to try my amazing Lavender Creme Brûlée? It’s flavored with real lavender buds and is elegant and delicious. This time, I replaced lavender with an ingredient I always have in my pantry. I think you have it too. It’s orange. This sweet and sour fruit has an incredible aroma and pairs beautifully with sweet and luxurious Creme Brûlée. In my easy recipe, I used a zest of 2 oranges which was a good amount. Make sure you have large oranges and if they are on the smaller size, you can use 3 oranges. First, you need to infuse cream with a rich orange flavor. Finely grate your oranges and stir zest into a cream. Add some vanilla extract too. Heat it up just until it starts to simmer, remove from the heat and let the mixture sit for 30-40 minutes. Next, nicely whisk together egg yolks and sugar and slowly pour in infused cream. Keep whisking until you have a smooth custard. Now, it’s advisable to sift everything through a fine mesh strainer. Alternatively, you can also use folded cheesecloth. The goal here is to achieve a silky smooth custard without small chunks of zest or egg yolk. Finally, distribute the custard among ovenproof ramekins placed inside a baking dish, fill it halfway up the ramekins and bake for 35-40 minutes. I have probably put the process in too many words, but the whole preparation time will take you no more than 15 minutes. 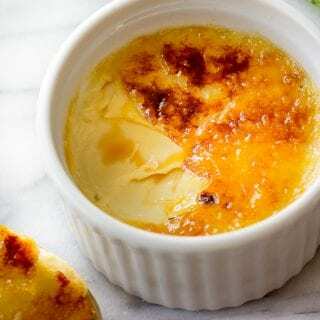 My Orange Creme Brûlée Recipe has only 5 ingredients and is a great treat for special occasions or simply when you crave a dessert that won’t brake the bank. Can Creme Brûlée Be Refrigerated? Creme Brûlée can be refrigerated without sugary crust for up to 3-4 days. When you’re ready to serve it, just sprinkle with the sugar and melt it using a blowtorch. After you made the crispy crust, Creme Brûlée should be consumed immediately, since repeated refrigeration will make sugary crust watery and unattractive. Amazing Chocolate Eclairs – my readers love this recipe for a reason. Easy to follow recipe for the best foolproof Eclairs ever. Dacquoise cake – soft meringue layers are smothered with Mascarpone cream and topped with fresh berries. Super delicious cake that will not disappoint. French Palmiers – super easy puff pastry dessert with apples and a touch of cinnamon. If you make this Orange Creme Brûlée recipe, take a picture and post it on Instagram with a hashtag #lavenderandmacarons. You'll love this ridiculously easy and delicious Orange Creme Brûlée Recipe. Whenever I make it for my family, it always goes fast. Silky, smooth and with a yummy crispy crust, can you say "no" to this? In a medium pot add cream, vanilla extract and orange zest and bring to a low simmer. Remove from the heat and let it rest for 30-40 minutes. In a large bowl whisk together egg yolks and 4 tbsp of sugar. Slowly add orange infused cream and whisk until no lumps remain. Strain custard through a fine mesh strainer. Place empty ramekins in a large rectangular baking dish and distribute Creme Brûlée among the ramekins. Fill the baking dish with the boiling water halfway up the ramekins and carefully transfer it into the oven. Bake for 35-40 minutes until Creme Brûlée is slightly wobbly in the center. 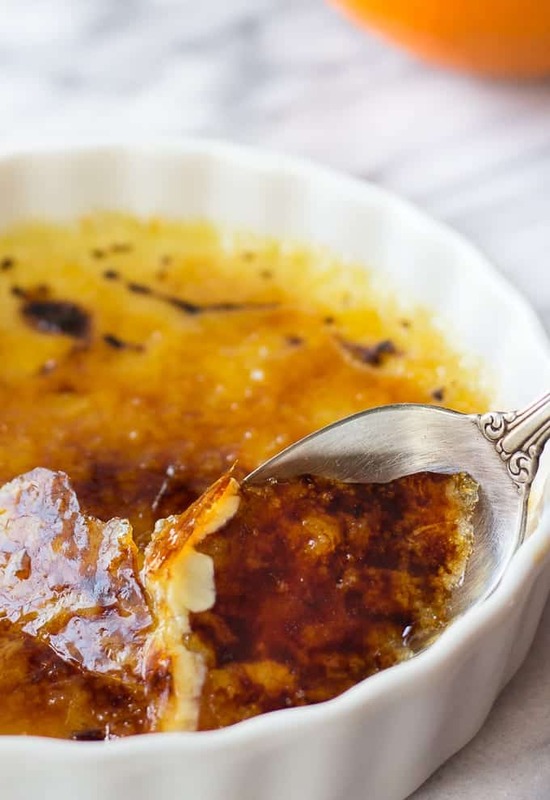 Remove Creme Brûlée from the oven, let it cool completely and refrigerate for at least 2 hours. If you don't have a culinary blowtorch, here's how you can create this amazing crispy crust. Sprinkle Creme Brûlée with 1-2 tbsp of sugar and place under the broiler for about 2 minutes or until sugar melts. Be careful, as the ramekins will be hot.